Purpose: Distance behaviors can be taught and refined with nose targeting. Equipment: Object such as a stanchion, pole, piece of tape on a wall, upright target stick, etc. Exercise set-up: The exercise begins when the handler cues the nose-touch behavior with a verbal and/or hand signal. Dog may start in any position with the handler (between legs, left or right side). 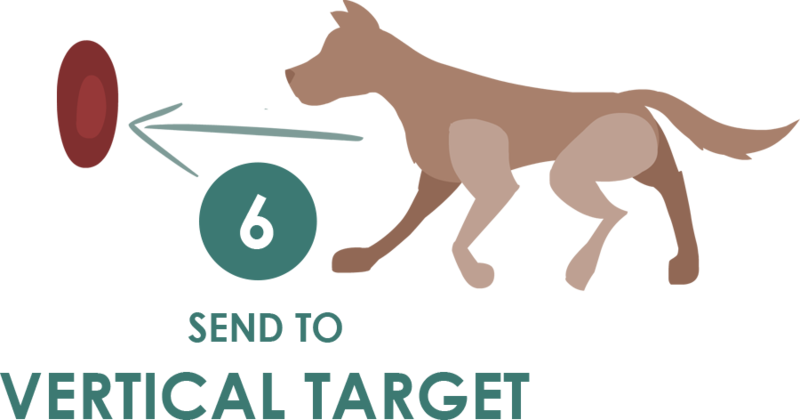 The exercise ends when the dog touches the target with his/her nose or is less than 1/2 body length away from target. Non-qualifiers: Dog requires multiple cues to go and approach or touch the object. Handler moves feet at any time. Object is less than 5 ft. (1.5 m) away from dog’s starting point. Dog stops more than 1/2 body length away from target. Dog makes an arc around the object rather than moving directly towards the object. Video does not permit the exercise to be adequately judged. Tip: The exercise ends when the dog is close (less than a half-body length) to the target; it is your choice to ask for a position, call the dog back, send the dog around, or go to your dog — nothing is judged after the dog reaches the target.